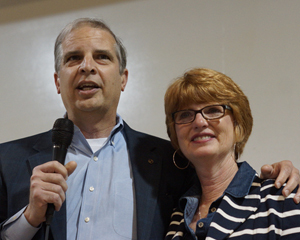 For Senator Mark Obenshain, fighting for our rights isn’t just a job—it’s a calling. Growing up in a home in which the discussion of politics was standard fare around the dinner table each night, the son of the man often dubbed the architect of the modern Republican Party of Virginia, Mark developed a passion for politics and a zeal for public service early in life, and he has emerged as one of the Commonwealth’s leading champions of limited government, individual liberty, and personal responsibility. Mark has been politically active practically his entire life. He has served as the chairman of two Republican committees, has been a delegate to every Republican state convention since 1980, and was a member of Virginia’s delegation to the 1980 Republican National Convention, which nominated Ronald Reagan. Mark has worked on the campaigns of virtually every Republican nominee for state and local office since he began practicing law in Harrisonburg in 1987, and he serves as the President of the Richard D. Obenshain Foundation, named after his father, which provides the Republican Party of Virginia with the building that is its permanent home. Mark was elected to the Senate of Virginia in 2003, where he serves as Chairman of the Senate Courts of Justice Committee. He also serves on the Commerce & Labor; Finance; Agriculture, Conservation, and Natural Resources; and Rules Committees. Mark is also Chairman of the Virginia State Crime Commission. He has quickly established himself as a conservative leader, taking the lead on property rights, school choice, family values, and government reform, and emerging as one of the Senate’s leading voices on public safety and other key issues. 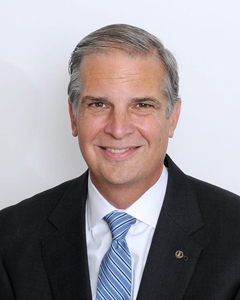 In his professional life, Mark is the founder of the Obenshain Law Group. Mark has practiced law in Harrisonburg and in Central Virginia for over thirty years, representing individuals and businesses in a wide range of legal matters. In addition to his law practice and service in the Senate, Mark is active in a variety of civic, community, professional, and political organizations. In 1994, Governor George Allen appointed him to serve on the Governor’s Commission on Citizen Empowerment, which established the framework for Allen’s comprehensive welfare reform program and served as a blueprint for federal welfare reform two years later. He subsequently served as a member of the Commission on Welfare Reform and the Commission on Government Reform and Restructuring, where he was one of the charter members, working to identify inefficiencies, eliminate waste and fraud, consolidate duplicative functions and agencies, and make government more citizen-friendly. In his own community, Mark served as a member of James Madison University’s Board of Visitors, and also served on the boards of the Harrisonburg Education Foundation, Mercy House, and the Shenandoah Valley Technology Council, as well as on the Advisory Board for the Harrisonburg Rescue Squad. Mark and his wife Suzanne have two children, Anne Tucker and Sam, and they are active members of Harrisonburg’s First Presbyterian Church. 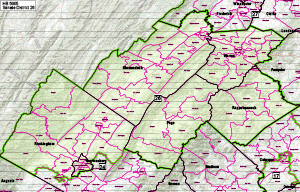 Virginia’s 26th Senate district includes the City of Harrisonburg and the counties of Rockingham (part), Shenandoah, Page, Warren, and Rappahannock. The Shenandoah and Page Valleys are some of the most beautiful areas in all of Virginia. Rich in beauty, history, and heritage, people from around the world are attracted to the bountiful entertainment and sites right here in the 26th District. It is a great place to raise a family, and I am honored to represent this beautiful and friendly district. Not sure if you’re in the 26th? Find out here, or examine a detailed map of the 26th.